Dive into this savory southwest-inspired enchilada entrée conveniently packed in a powerhouse bowl. 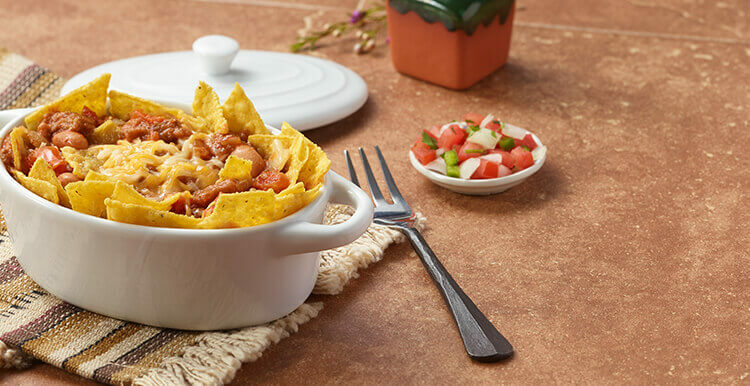 Featuring a delicious layering of pinto beans, juicy beef, tortilla chips, three types of cheeses and a touch of chili powder for a mild kick. Ingredients: WATER, PINTO BEANS (PINTO BEANS, WATER, SALT, CALCIUM CHLORIDE), COOKED BEEF, TOMATOES, TORTILLA CHIPS (WHOLE GRAIN CORN TREATED WITH LIME, SOYBEAN OIL AND/OR CORN OIL WITH TBHQ AND CITRIC ACID TO PRESERVE FRESHNESS, WATER), ONION, TOMATO PASTE, CHEDDAR CHEESE (MILK, CHEESE CULTURES, SALT, ENZYMES, ANNATTO COLOR), MODIFIED FOOD STARCH, MOZZARELLA CHEESE (PART-SKIM MILK, CHEESE CULTURES, SALT, ENZYMES), MONTEREY JACK CHEESE (MILK, CHEESE CULTURES, SALT, ENZYMES), AND LESS THAN 1% OF DRIED ONION, CHIPOTLE PEPPER PUREE (CHIPOTLE PEPPER, WATER, SALT, VINEGAR), SEA SALT (SODIUM CHLORIDE, POTASSIUM CHLORIDE), GARLIC (GARLIC, WATER), SPICES, CHILI POWDER (CHILI PEPPER AND OTHER SPICES, SALT, GARLIC POWDER), CHILI POWDER (CHILI PEPPER, SALT, RED PEPPER, OREGANO, CUMIN, GARLIC), BEEF BASE (BEEF, FLAVORS, SALT), DRIED GARLIC, DEXTRIN. Nutrients: WATER, PINTO BEANS (PINTO BEANS, WATER, SALT, CALCIUM CHLORIDE), COOKED BEEF, TOMATOES, TORTILLA CHIPS (WHOLE GRAIN CORN TREATED WITH LIME, SOYBEAN OIL AND/OR CORN OIL WITH TBHQ AND CITRIC ACID TO PRESERVE FRESHNESS, WATER), ONION, TOMATO PASTE, CHEDDAR CHEESE (MILK, CHEESE CULTURES, SALT, ENZYMES, ANNATTO COLOR), MODIFIED FOOD STARCH, MOZZARELLA CHEESE (PART-SKIM MILK, CHEESE CULTURES, SALT, ENZYMES), MONTEREY JACK CHEESE (MILK, CHEESE CULTURES, SALT, ENZYMES), AND LESS THAN 1% OF DRIED ONION, CHIPOTLE PEPPER PUREE (CHIPOTLE PEPPER, WATER, SALT, VINEGAR), SEA SALT (SODIUM CHLORIDE, POTASSIUM CHLORIDE), GARLIC (GARLIC, WATER), SPICES, CHILI POWDER (CHILI PEPPER AND OTHER SPICES, SALT, GARLIC POWDER), CHILI POWDER (CHILI PEPPER, SALT, RED PEPPER, OREGANO, CUMIN, GARLIC), BEEF BASE (BEEF, FLAVORS, SALT), DRIED GARLIC, DEXTRIN.